On October 8th, bike rental startup ofo released “2017 National Day Holiday Travel Data Report.” According to the report, the capital of the Tibet Autonomous Region, Lhasa showed the highest increase of ofo usage during National Day, Chinese media Sohu is reporting. Data show that ofo enjoyed a significant increase in cycling trips on October 1st, the National Day. After showing a slight slowdown on October 4th, the Mid-Autumn Festival day, the number of trips rose again on October 5th. During the holiday, the time of using bicycle rental service was smoothly spread out, without showing morning or evening peaks. The first batch of bike travel showed a 1-hour delay (compared to before the holiday) and daytime travel concentration was greater than usual. The average number of bicycle rental services used by active users was increased by 15.4%, reducing the urban traffic jam in Chinese cities. During the holidays, bicycle rental users were mainly young and male. Male users accounted for 57%, while female users accounted for 43%. The proportion of young user groups aged 18 to 25 and 25 to 30 accounting for 55% of all users. In addition, the average bike riding speed reduced from the normal 2.12 m/s to 2.0 m/s, showing a 5.5% overall speed reduction; bike riding distance increased from 1.56 km to 1.69 km, an 83% increase. The report concluded that the rides were probably more recreational and less urgent than during non-holiday periods. Bicycle rental users were mainly concentrated in the shopping district, scenic spots, and transportation hub. When it comes to bike travel purposes, leisure and entertainment in shopping area accounted for 40.1%, scenic travel accounted for more than 34.5%. The top 10 shopping districts in China during the National Day included Beijing Wangfujing, Shanghai People’s Square, Chengdu Chunxi Road, Beijing Xidan, and Shanghai Huaihai Road. 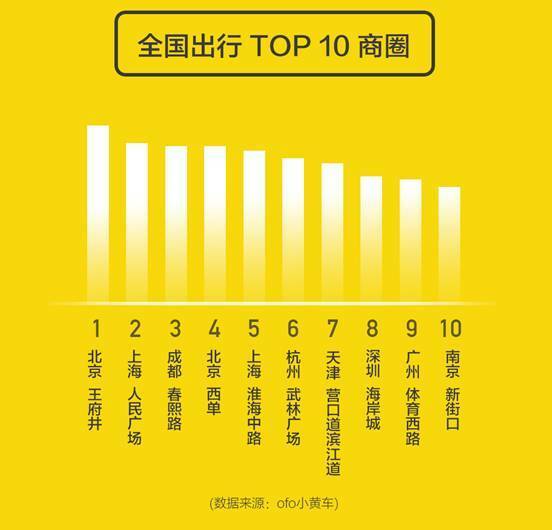 The top 10 cities in National Day were: Beijing, Shanghai, Chengdu, Tianjin, Shenzhen, Guangzhou, Xi’an, Wuhan, Hangzhou, and Nanjing. The Top 10 attractions were: Hangzhou West Lake, Beijing Tiananmen Square, Shanghai Bund, Beijing the Forbidden City, Chengdu wide alley (宽窄巷子), Beijing Summer Palace, Nanjing Sun Yat-sen, Xiamen Gulangyu, Xi’an Big Wild Goose Pagoda, Shanghai Oriental Pearl Tower. 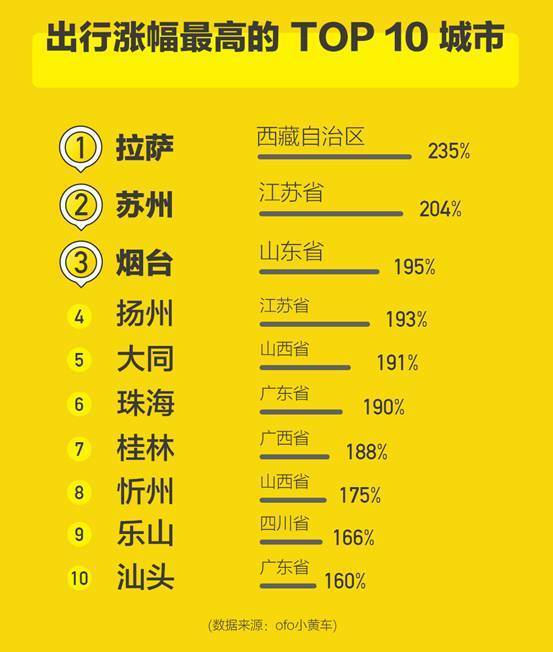 The top 10 cities that showed the highest increase in ofo usage on National Day were Lhasa, Suzhou, Yantai, Yangzhou, Datong, Zhuhai, Guilin, Xinzhou, Leshan, and Shantou. Among them, Lhasa rose the highest, reaching usage number of nearly 3.5 times a day. ofo has been actively promoting its trips by giving out red packet (hongbao) rides and free rides. Due to these efforts, the average utilization rate of shared bicycles reportedly increased by 11.6%, preventing cumulative travel carbon emissions by more than 78,000 tons. Among them, Beijing was the top city with the most bicycle rental service usage.